I’ve said it before, but I love trying new things. Sometimes too much, to the point that I shell out plenty of money for an interesting looking product, and while it usually turns out at least somewhat decent, sometimes it’s just too bad to eat. Like Incan berries, way too sour and bitter and hard…never again. But usually, trying new combinations turns out to be a successful experiment, and sometimes I even find new favorites. But you can’t deny the appeal of old favorites–they almost never disappoint! Smoothie in a bowl for lunch. Spinach+peanut flour+chocolate Sunwarrior+banana+1/4 avocado+shredded coconut+cacao nibs. I’ve had green smoothies before, but never with avocado. I’ve heard how creamy smoothies get with added avocado so I figured I’d give it a try. I only used a little bit to make sure it didn’t taste too avocado-y and it was a great addition. 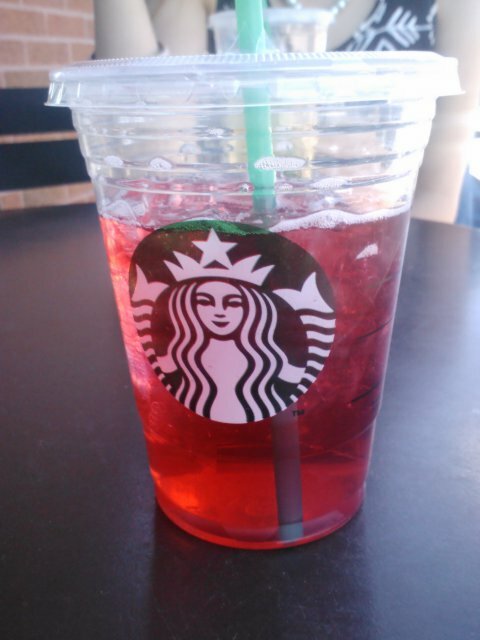 Grande unsweetened passion iced tea. One of my favorite summer Starbucks ordered. My only complaint is that Starbucks doesn’t have stevia, but I usually just remember to bring my own. Socca is a staple of mine, but I’ve usually eaten it in pizza or ‘omelette’ form. 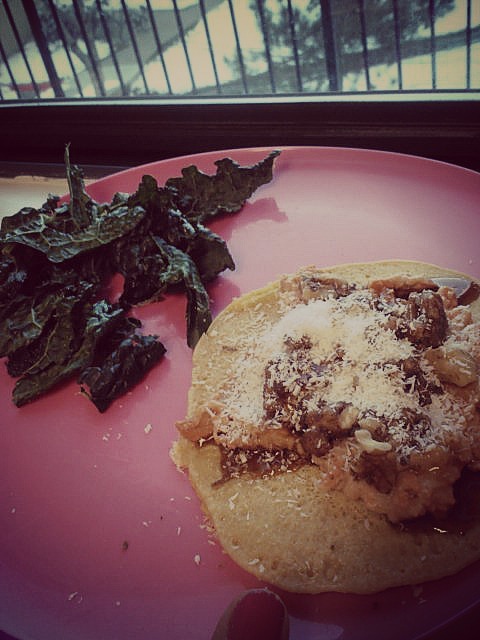 One night I was wanting guac but I didn’t have any corn tortillas so I decided to use socca as a protein-packed tortilla sub, and topped it with kimchi and kale chips too. Really random, but it was good enough to repeat a few days later. Summery outfit. Dark grey crop top: American Eagle. 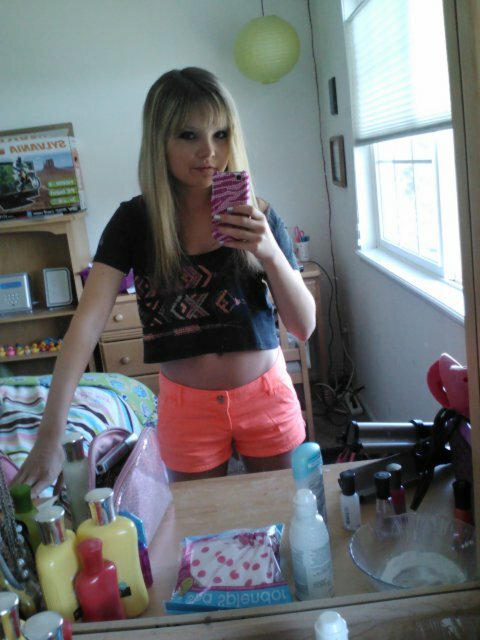 Coral shorts: Hollister. It’s definitely been shorts weather around here. We don’t have A/C so my room is unbearable most days (it doesn’t help that it’s south-facing and upstairs) so even this outfit felt way too hot. But it’s perfect sunbathing weather. 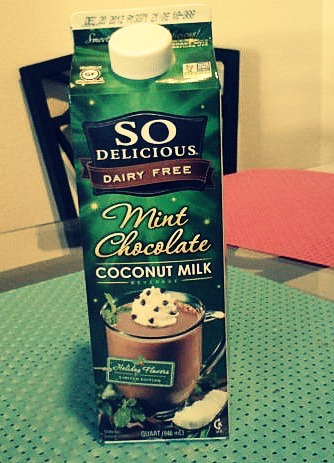 New find in the frozen section at Whole Foods! 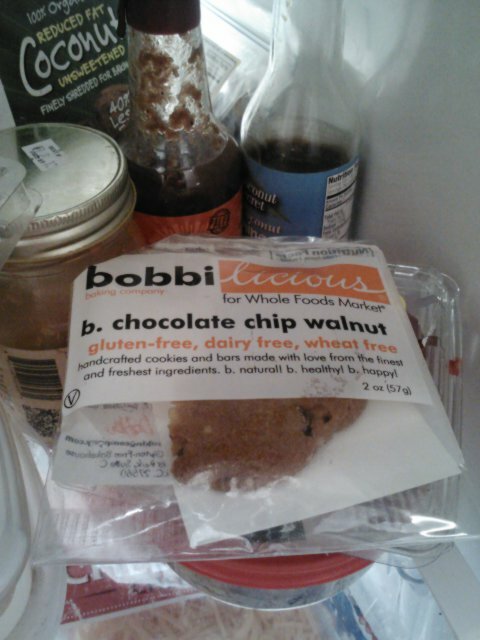 GF and vegan chocolate chip walnut cookie. I used to get the bakery-made vegan cookies from Whole Foods sometimes, but they were wheat-based and often gave me stomach issues. I was thrilled to find an option that was both gluten free AND vegan (harder to find than you’d think) and that is fairly clean and tastes delicious. 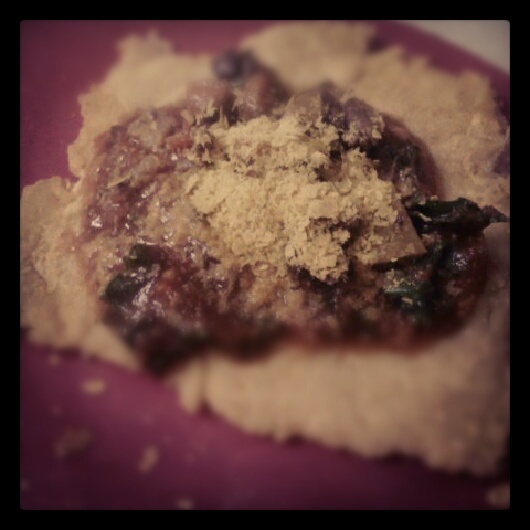 The addition of almond extract really takes it over the top, and the texture is fantastic for being almond flour based. Raw powerbowl. 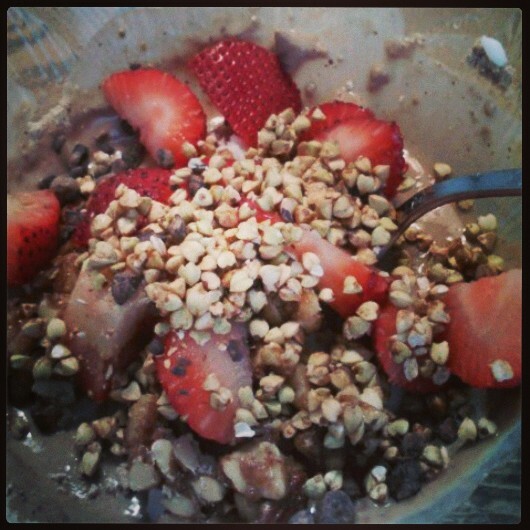 Chocolate sunwarrior ‘pudding’ topped with homemade cinnamon buckwheat rawnola, strawberries, cacao nibs, 1/2 banana bread Uber Larabar, coconut butter. I’ve been loving meals in a bowl lately. 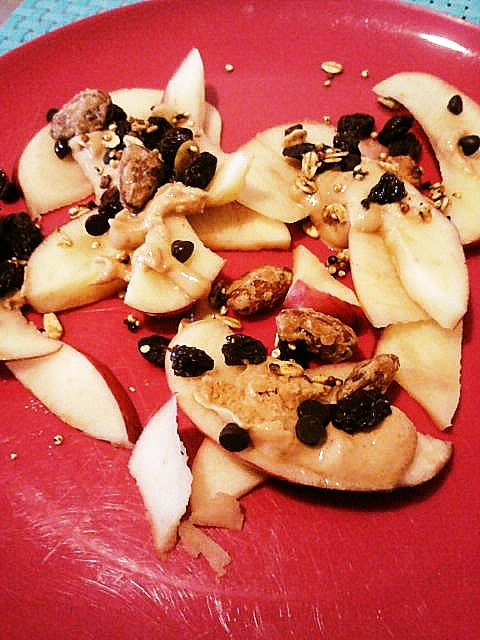 This was a mostly raw dessert-like snack that I threw together from the few things I have for snacks. 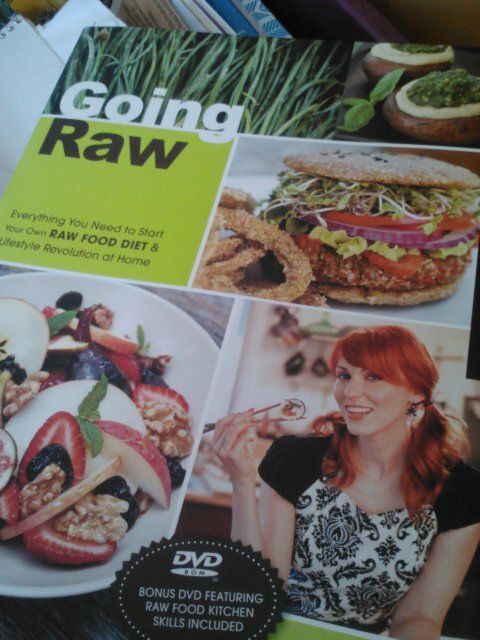 I really need to make a Whole Foods trip ASAP to stock up on raw stuff! 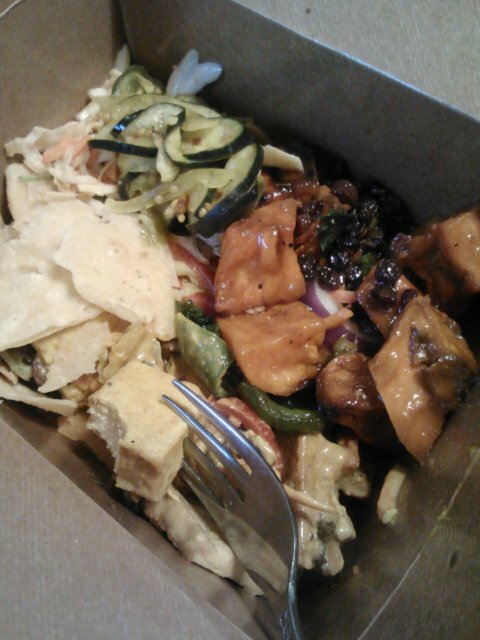 Whole Foods salad bar box. Again. Never gets old. ‘nough said, but really, this never gets old. Oh, and I really don’t get these that much (maybe once every other week or once a week) but I feel the need to post them every time because I love the Whole Foods salad bar a LOT. A vegan and GF take on the BLT. 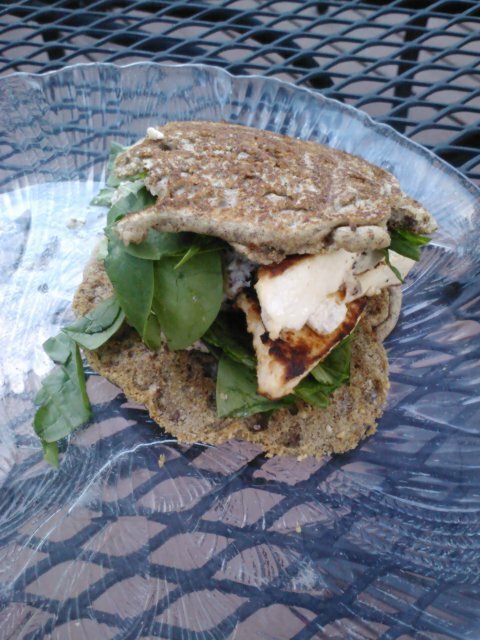 Buckwheat & almond flour pancake ‘bread’, spinach, tofu ‘bacon’ and raw Caesar dressing. This was a totally random, this-sounds-good-I’ll-just-throw-it-together kind of dinner, but it was a real winner. 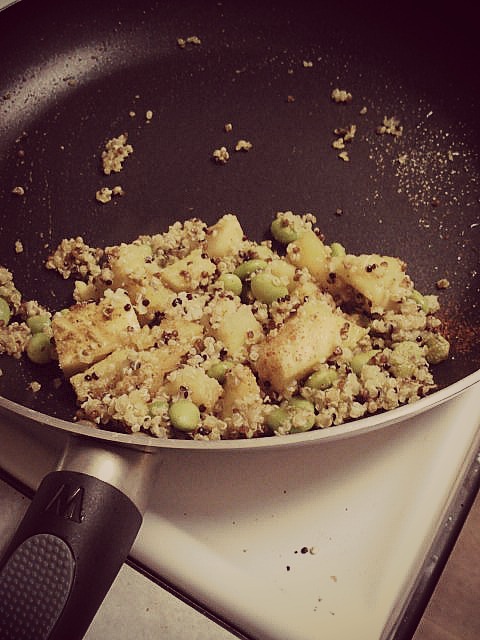 I marinated the tofu in coconut aminos+liquid smoke+a little maple syrup and quickly pan fried it in coconut oil. I mixed together buckwheat and almond flours with flax and salt and water to make quick pancake ‘bread’ slices and whipped together a raw Caesar-like dressing from soaked cashews, half a nori sheet, nooch and spices. It came together pretty quickly and was repeat worthy. 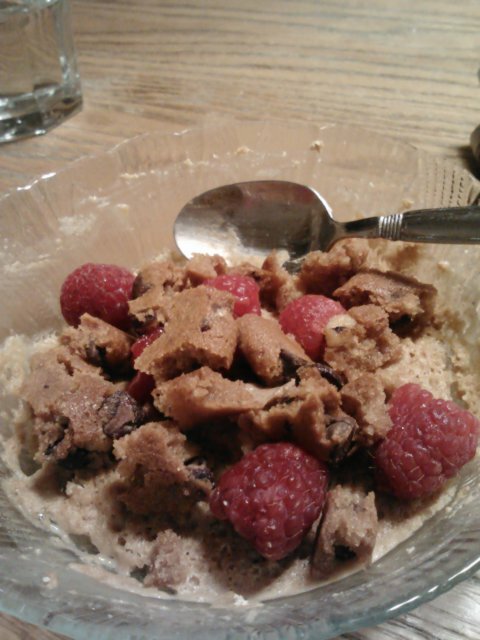 Dessert: peanut flour microwave muffin topped with Justin’s vanilla AB, raspberries and 1/3 GF vegan chocolate chip walnut cookie. Another meal in a bowl. Having fresh raspberries again makes everything so much better. 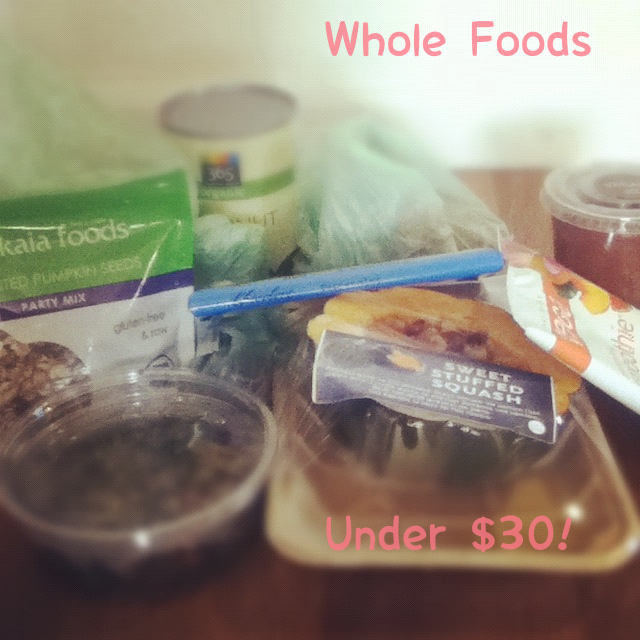 And splurging on Justin’s vanilla almond butter (sooooo good!) is making me want to put it on everything. Kind of a problem when it costs $8, but I’m going to try to make it last longer than 2 weeks. What are some of your new and old favorites? It’s finally May! Can you believe it? This year has already flown by, and I’ll be packing up to go home for the summer in just about 2 weeks. I’m not sure if you’re as much of a weather nerd as I am (actually, pretty sure you’re not since I’m pretty obsessed, but hey, it is my job!) 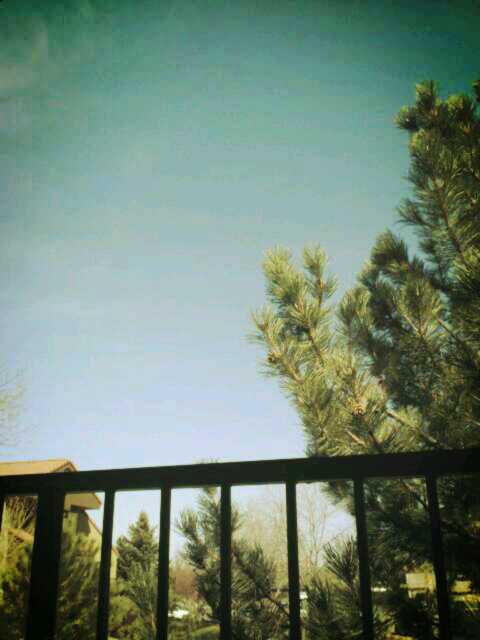 but if you’ve been keeping up with the national forecast, good old Colorado is getting yet another snowstorm today. Yep, May 1st. Snow isn’t totally unusual here, but since we’re supposed to get around 6 or more inches (writing this on Tuesday when it’s still raining, not snowing yet and hopefully won’t), that’s way more than normal. Can you believe we were at 80 degrees on Monday? This is just insane, and really not fair. Anyways, I’ll stop my weather complaints and move on to better things…namely WIAW! This one will be fairly wordless other than captions, but full of recent food photos so enjoy! 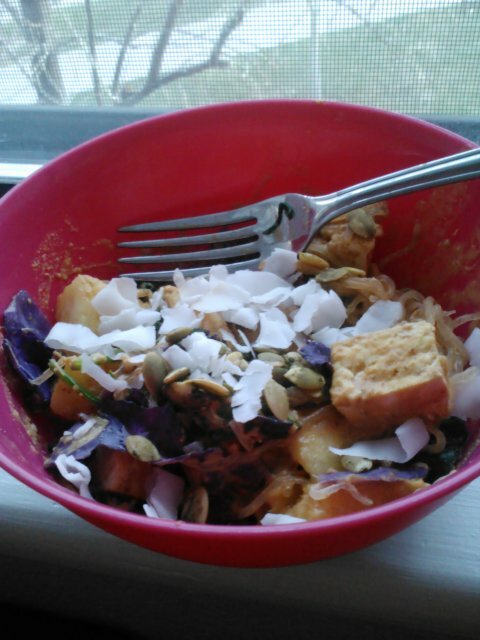 Fully loaded kelp noodle stirfry: kelp noodles, peanut flour/curry/coconut aminos sauce, pineapple/mango, spinach, red cabbage, pan fried tofu, coconut flakes and sprouted pumpkin seeds. 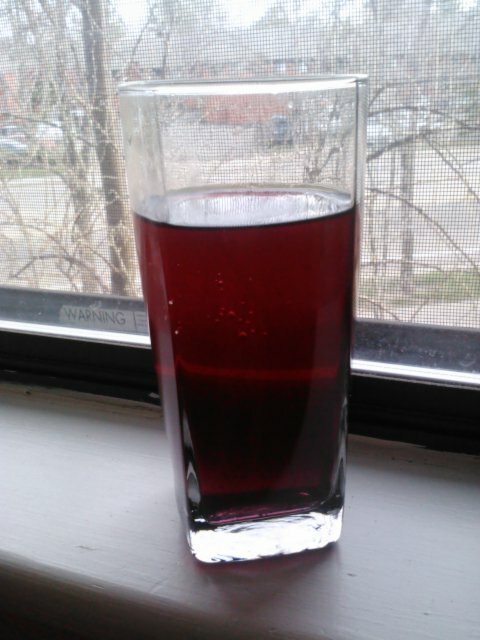 Homemade blueberry infused, watermelon stevia sweetened water. 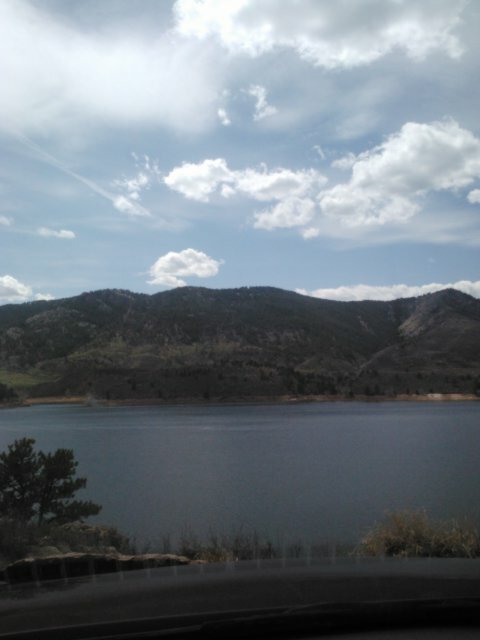 Horestooth Reservoir and the mountains. One of the biggest lakes in Colorado is in my backyard. Nothing better than mountains+water! 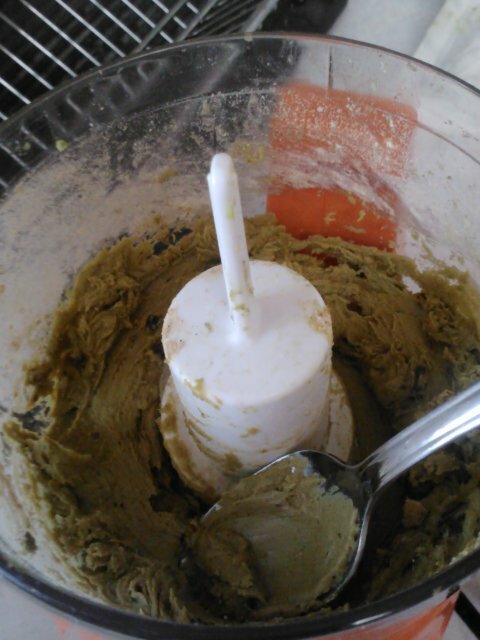 ‘Guacachoc’ PB protein mousse, aka avocado mousse. Recipe to come! More clean nachos! 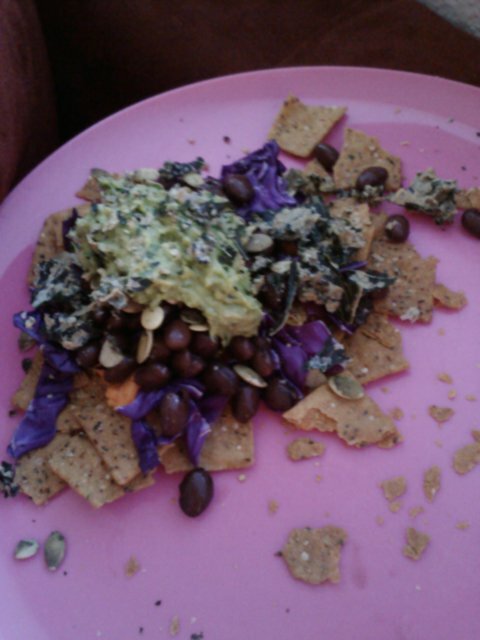 Sprouted sweet potato chips, red cabbage, homemade guac, sweet potato, black beans and sprouted pumpkin seeds. 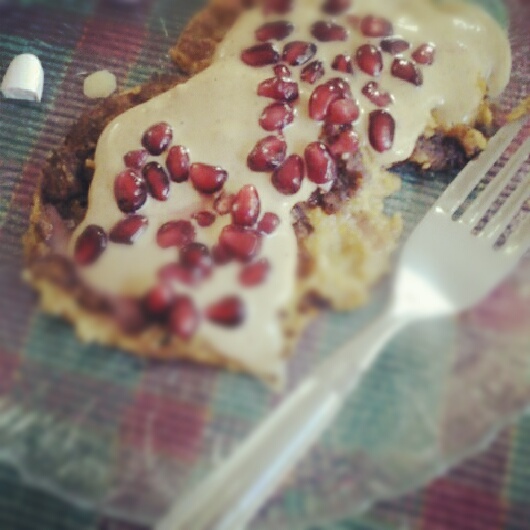 Grain free protein pancakes. 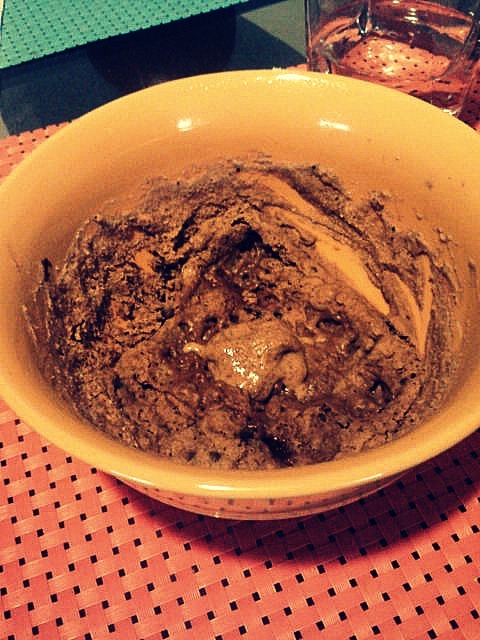 Mix of chocolate Sunwarrior and garbanzo flour. Topped with PB, homemade pumpkin grainless granola and dark chocolate chips. Beautiful weekend weather in the 70s. Raw snackplate. 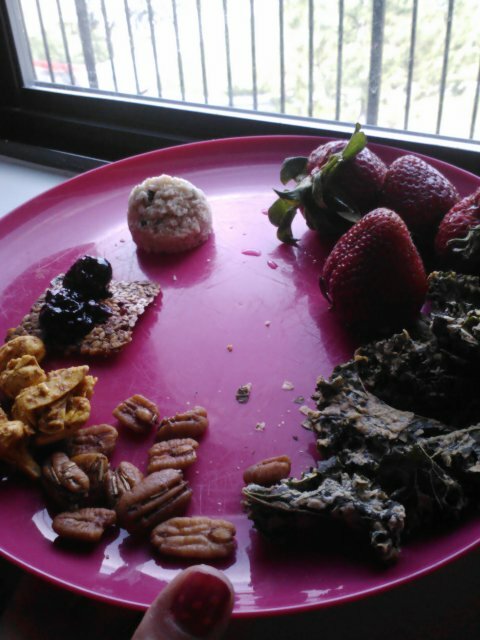 Cacao nib macaroon, organic strawberries, southwestern ranch kale chips, orange rosemary pecans, Thai lemon curry cashews, currant flacker with homemade blueberry vanilla chia jam. 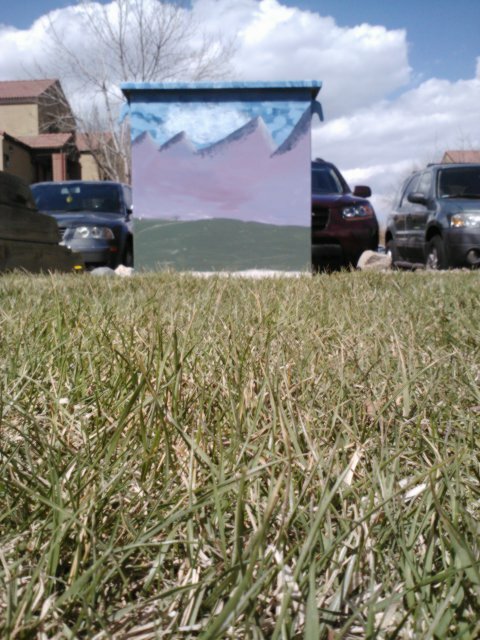 Green-ish grass and sunny skies (and my Alejandro behind the power box). 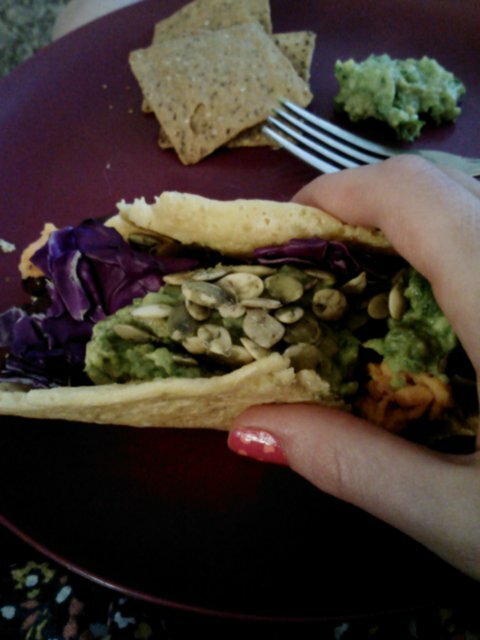 Socca-style taco filled with raw red cabbage, black beans, sweet potato, homemade guac and sprouted pumpkin seeds. Is is almost summer where you are (school wise, or weather wise)? What’s the best thing you ate this weekend? Before I get to the best party of every week, I wanted to share a little news with you guys. I’ll be doing a couple reviews (with a possible giveaway) within the next week so look forward to that! I love entering giveaways and reading reviews so I’m really happy that companies have started to reach out to me to share their products with my readers. Now onto the eats! I’ve been eating a lot of “new-to-me” stuff lately which I always love. I’m not really a creature of habit, I do know what I love and stick with that but I really like switching things up and trying out new food. I did some of that over spring break and apparently that trend is continuing this week. 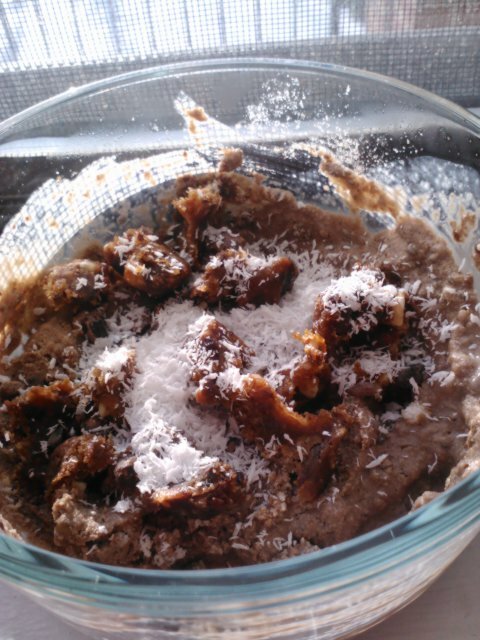 Breakfast: chocolate coconut chia protein pudding topped with cacao nibs, shredded coconut and chocolate chip cherry torte Larabar. 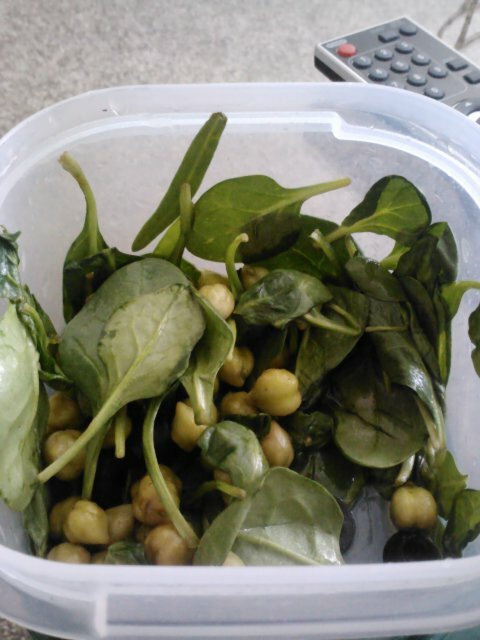 Lunch: spinach salad with green garbanzos and balsamic. The salad-for-lunch thing isn’t new (I’ve been eating one almost every day for three months!) but the green garbanzos sort of are! I bought some frozen ones from Whole Foods on a whim about a month ago and haven’t been using them a lot, but they’re really good in salads drizzled with balsamic vinegar. I’d love to try making falafel from them too! 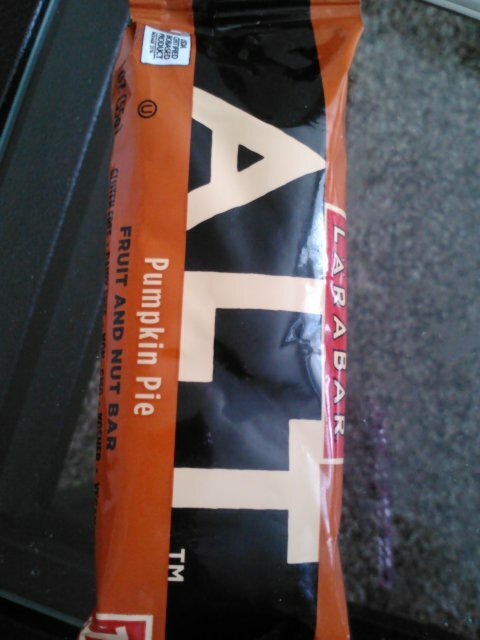 Lunch side: half a pumpkin pie ALT Larabar. If you have the new ALT bars near you, please try them! Especially this flavor. It reminds me of spice cake, and is really good and filling! Half of one made the perfect lunch dessert, and it had 5 grams of pea protein to boot (the entire bar has 10 grams). 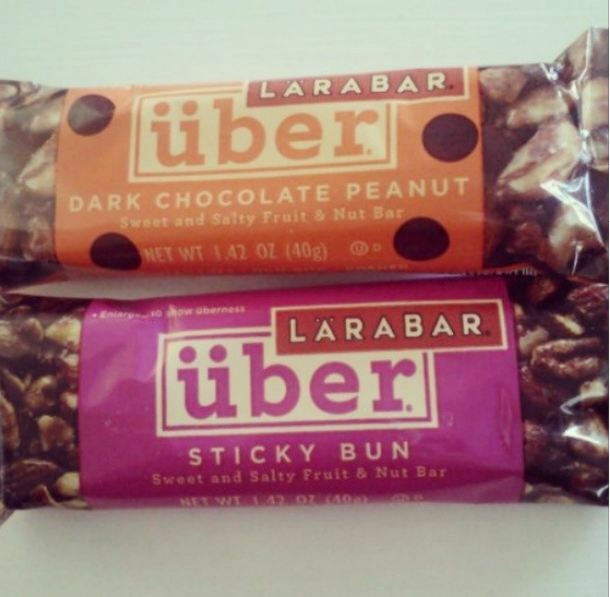 I love finding all-natural vegan protein bars that actually taste good! 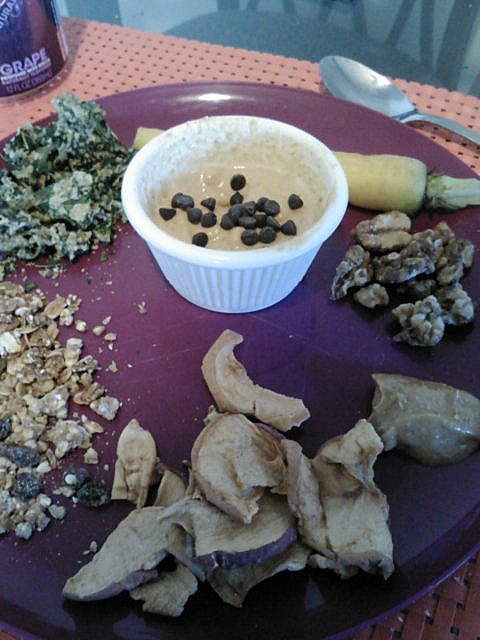 Snack: snackplate of yellow carrot, maple mesquite sprouted walnuts, baked apple chips, Kaia buckwheat rawnola and Purely Elizabeth pumpkin fig GF granola, southwest ranch kale chips, peanut flour paste with mini dark chocolate chips. The kale chips are semi-new (the southwest ranch flavor of Kale Krunch chips is unreal) and so are the apple chips and the cashew butter (the WF brand reminds me of cookie dough, but it’s just made from cashews and a little safflower oil!) 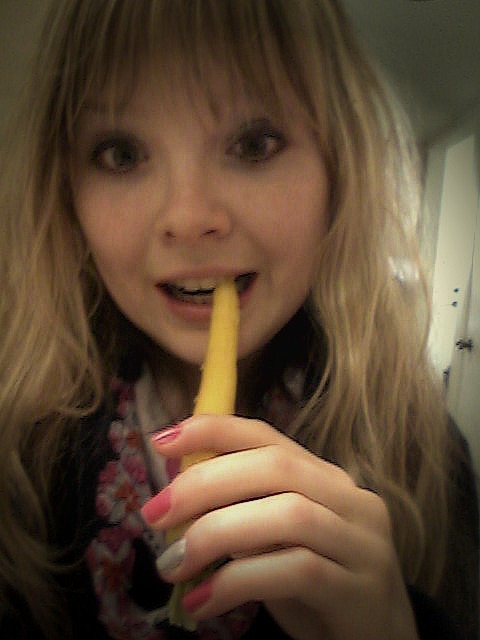 but the real newbie is the yellow carrot. Can you believe I’d never had a whole carrot before a week ago? I spotted a bunch of tri-colored carrots at Whole Foods and just had to snag them. I don’t think I’m gonna rely on baby carrots so much anymore, I love the crunch of these full size carrots! And the fun color is just an added bonus. I’ve been wanting to try this flavor for awhile, but I didn’t want to pay $5 for a 6 pack, in case I didn’t like it. Verdict: while it’s not my favorite flavor (that would be the cream soda) , it actually grew on me and I do like it. At first it reminded me of children’s Tylenol, but it’s actually pretty tasty! Dinner: sauteed kale, sweet potato socca pizza. Socca pizzas are a staple around here, but this was a first for me–a sweet socca pizza. I made my usual socca base (1/4 cup chickpea flour, salt, enough water to thin) and topped it with 1/4 of a mashed sweet potato mixed with almond milk and cinnamon, crumbled maple mesquite walnuts, shredded coconut and a drizzle of maple syrup. It was like dessert pizza for dinner, and it was oh so good! These were actually all my meals for Monday, minus my nighttime snack (unpictured because it was eaten too late for a good photo to be taken), which was coconut flour mixed with a little baking powder, chocolate chips and almond milk and microwaved to make a coconut flour muffin, a square of Alter Eco dark mint chocolate, peanut flour paste and a date stuffed with cashew butter and cacao nibs. Nothing exciting, but I love it. 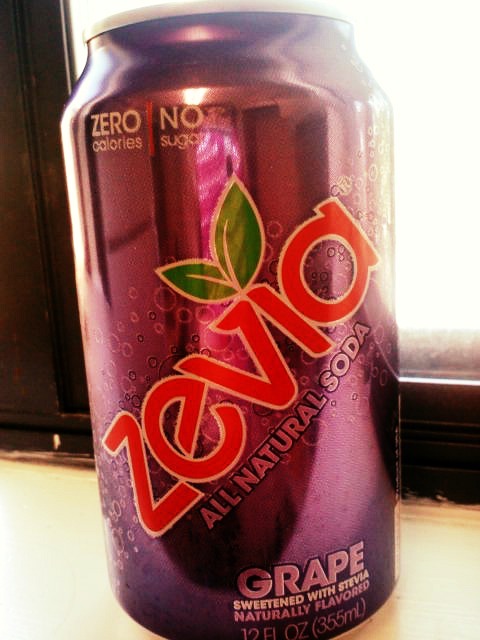 If you’ve tried Zevia, what’s your favorite flavor? Have you ever eaten a weird colored veggie? Yep, always have, (probably) always will. It’s a combination of the texture, taste and smell for me. Ick. I could never do any form of eggs for breakfast–I blame my dad, because he’s never been a big fan of eggs. So that aspect of going vegan was super easy for me! While I think things like veggie-filled omelettes and 2 ingredient pancakes are cool ideas, I’d never be able to stomach them. Just no. 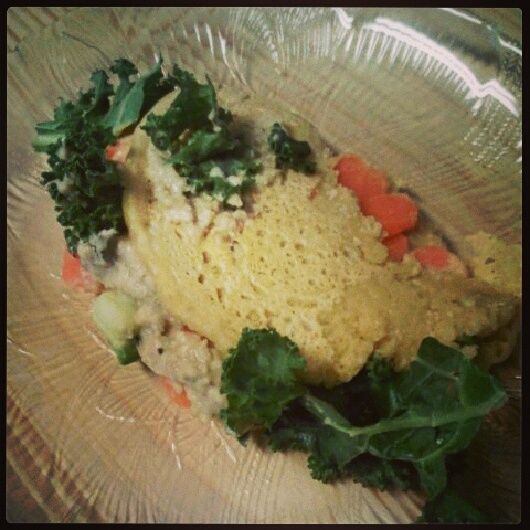 This is as close as I get to an omelette–a chickpea socca-style ‘omelette’. I’m not a Chobani/Love Grown/ Luna Bar/ PB&Co. whore. There’s quite a few brands that seem to be really popular in the HLB world…and I’ve never understood them. To each their own, of course, but I’ve tended to go my own way with brands and I love what I love. I do like a few of the popular brands, like Larabar and Almond Breeze, but some of them just don’t do it for me. For instance, I prefer unflavored almond butters to flavored PBs (other than Justin’s vanilla AB) and I really love Purely Elizabeth granolas because they’re made from ancient grains and is the only granola brand I know of that’s made with coconut sugar. 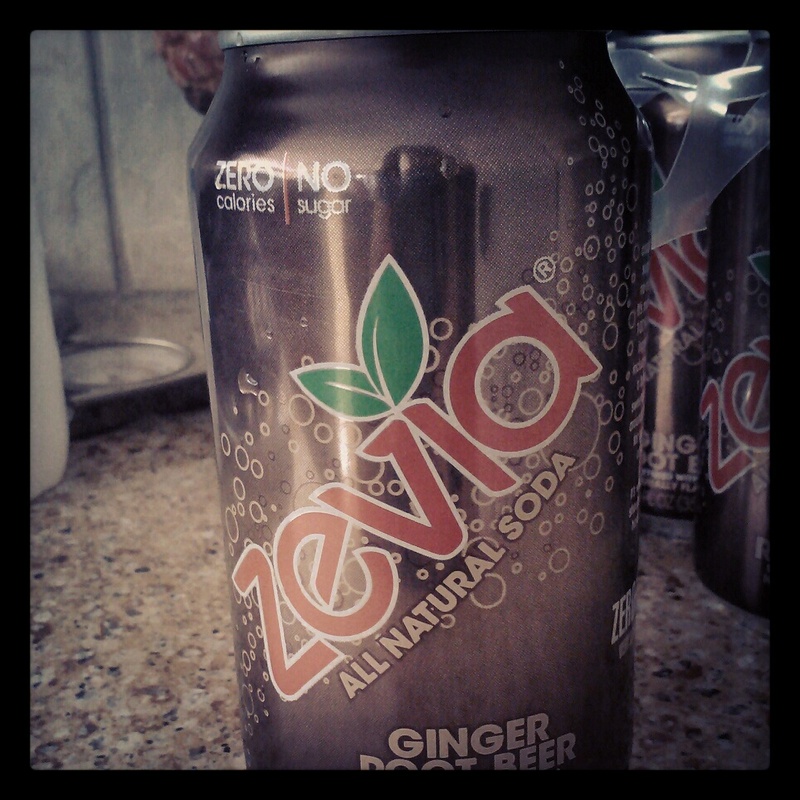 I don’t feel bad for being a Zevia whore because it’s so good! I’ve never stepped foot in a Lululemon or a Trader Joes. It’s not that I don’t want to shop in these places, it’s just that I’m semi-deprived out here in CO and neither of those stores are near me (okay, that’s a lie, there’s a few Lulus in Denver, but I’ve never been). I’m actually waiting on a couple of TJs locations that are set to open soonish, but since I’ve never been, I feel a little left out. 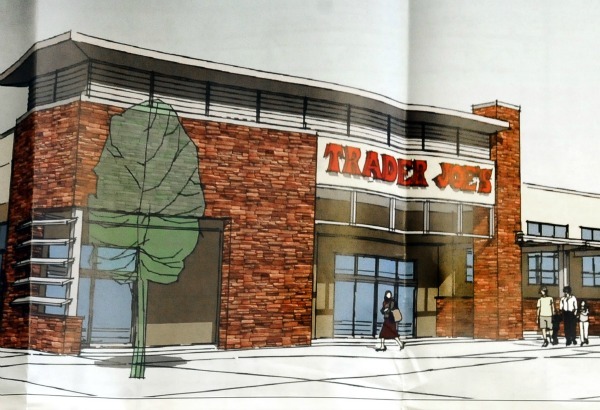 Maybe it’s for the best–I can’t afford anything from Lulu and I’d probably blow my budget if I had a TJs in my city! A drawing of the TJs that will be closest to me…still about an hour’s drive away. I’m not a runner, or a Crossfitter, or a heavy lifter. I have started lifting recently, and I really love it, but I’m nowhere near lifting heavy yet. As for running and Crossfit, I just don’t feel like they fit my lifestyle. I like doing cardio like tennis or circuits (or window shopping 😉 ) and I also love yoga. There’s definitely a workout style out there for everyone, you’ve just gotta find what works for you. 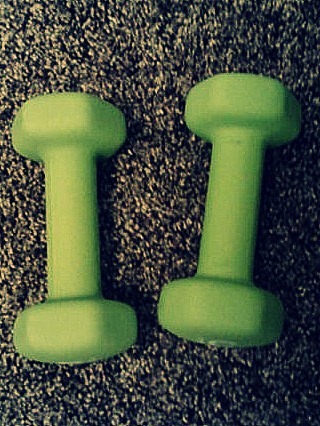 Lifting green weights makes it even more fun. 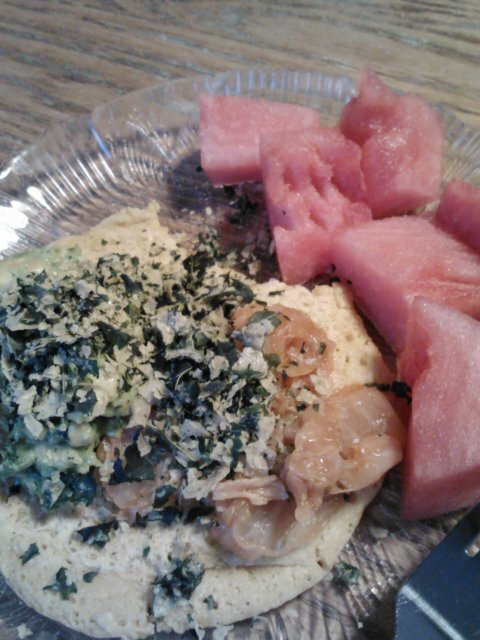 I don’t eat the typical HLB breakfast. I’m a huge breakfast lover, but (obviously) I don’t do eggs, I don’t really like oats anymore and yogurt messes are out because vegan yogurts are beyond nasty. I tend to mix things up a little bit, but right now I’m loving homemade buckwheat waffles with protein frosting, and chia seed protein puddings. I really try to get a great balance of carbs, fat and protein in at breakfast while still satisfying my sweet tooth. 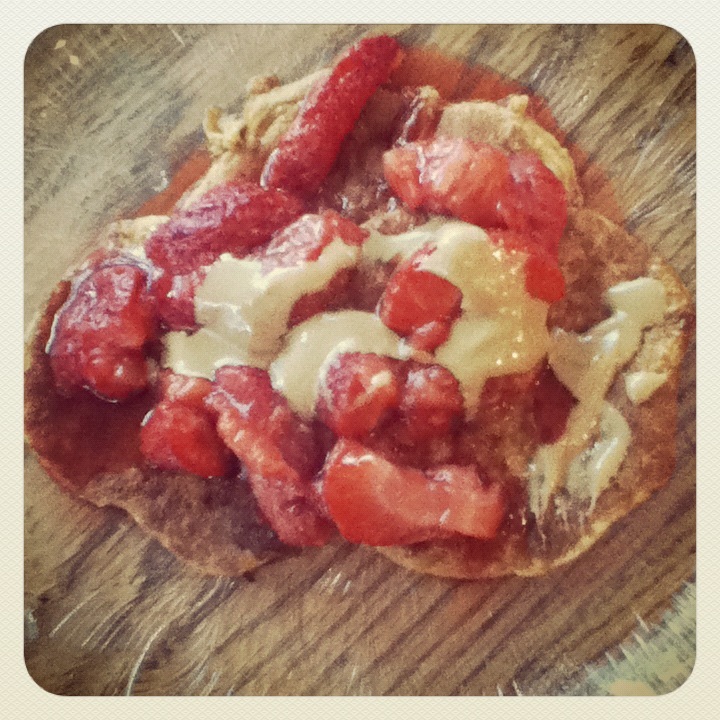 Another one of my fave breakfasts: almond flour pancakes. Vegans seem to be a rare breed these days in the HLB world. And honestly, I kinda like it this way but also not. I like it because then I feel more unique, like that’s the niche my blog fits into. 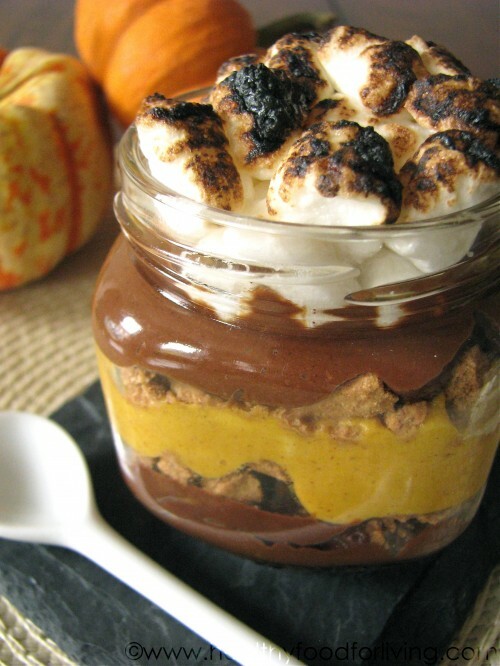 But I also don’t like it because there’s not as much food inspiration…so I just end up borrowing from the boys omnis! A (non-vegan) dessert I still need to veganize. How are you not like the ‘typical’ HLB? Any current or former vegetarians and vegans out there know this question all too well: “So where do you get your protein?” To most omnis, protein is only found in meat, eggs and dairy products. But as we all know, protein is found in pretty much everything, from kale to cacao nibs. Yes, there are actually 3 grams of protein in a one ounce serving of cacao nibs, which is all the more reason to enjoy chocolate 😉 Anyways, the point is, even strict vegans don’t need to worry much about adequate protein consumption as long as they’re consuming enough calories as well. However, I do love a lot of plant-based protein sources–I love me some healthy carbs, but I can’t survive on those alone. Last year, when I was just starting out on my vegan journey, I gravitated more towards carbs, which is okay, but nowadays I have a much better balance of fats, protein and carbs and I feel a lot more energized. If I had to categorize my macros, I’d say I’m usually around 45% carbs, 20-25% protein and 30-35% fats. That’s a big change, especially in the fats department, but I’m definitely embracing protein a lot more today too. That being said, here are Monday’s protein-packed, plant-based eats. Note: I am a big fan of plant protein powders (not soy-based ones, but ones made from sprouted quinoa/rice, pea and cranberry proteins, like Vega and Sunwarrior) and I use them frequently, but I don’t think they’re a necessity in a plant-based diet. I use them (along with peanut flour, which isn’t really a protein powder but just concentrated peanut protein that tastes AMAZING) because I like how they taste and that they give me a protein boost for relatively fewer calories. Yes, I will admit that I still have a fear of eating ‘enough’, mostly because I don’t know what ‘enough’ is for me and it’s scary to change our habits. I do like whole food sources of protein, but protein powders are fun and tasty and I always choose the less processed versions. Breakfast: banana bread in a bowl. 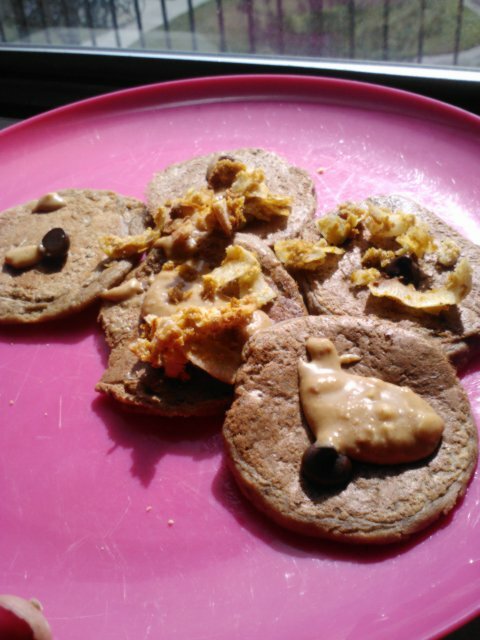 Garden of Life RAW chocolate protein powder, half of a mashed banana, almond milk, mini Enjoy Life chocolate chips, topped with Maranatha maple almond butter. 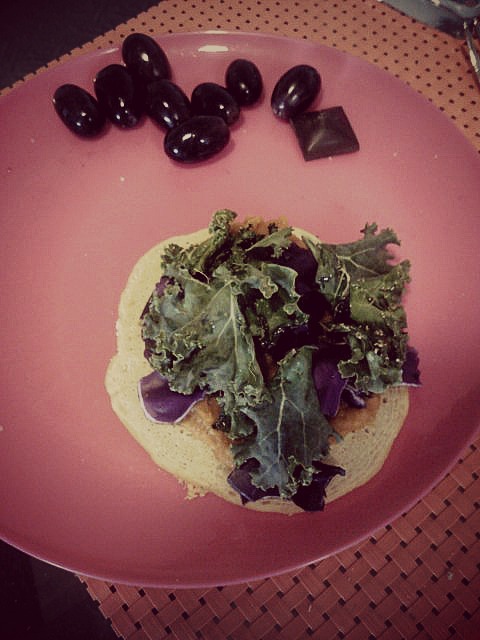 Lunch: pumpkin curry socca pizza topped with kale and red cabbage, side of black grapes and Chocolove peppermint dark chocolate square. Socca is a great way to have pizza while still getting in some great protein. I love loading up my pizzas with veggies, and since I don’t eat cheese, most traditional pizzas don’t have much in the way of protein. But socca does, and I love it! Today’s version had a pumpkin curry sauce (made by mixing pumpkin puree and a premade coconut curry sauce) and was topped with sauteed kale and crunchy red cabbage. Perfect combo! 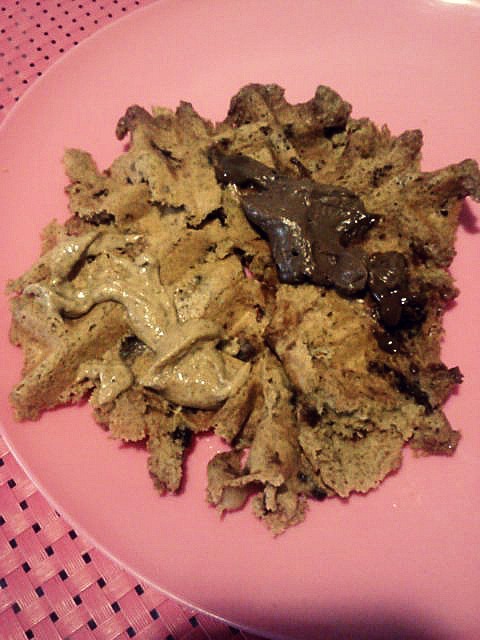 Afternoon snack: peanut and buckwheat flour waffle, topped with maple almond butter and vegan chocolate mousse. You guys already know I have an insane obsession with homemade waffles. I love everything about them–the toppings, the texture, the endless flavor options, the flour choices. This one was made with a mix of (mostly) peanut flour and a little buckwheat flour and then topped with my new favorite almond butter and some mousse from the Whole Foods dessert section (it has a really great ingredients list of just dark chocolate, tofu and maple syrup). 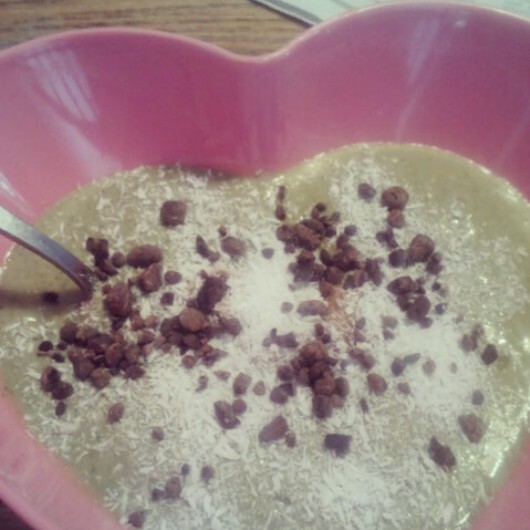 I added in a bit of banana and some more chocolate chips into the batter and it was just too good. Dinner: pineapple fried quinoa, with edamame and (unpictured) Kaia raw sprouted “party mix” pumpkin seeds, unpictured side of kabocha squash dipped in organic ketchup. 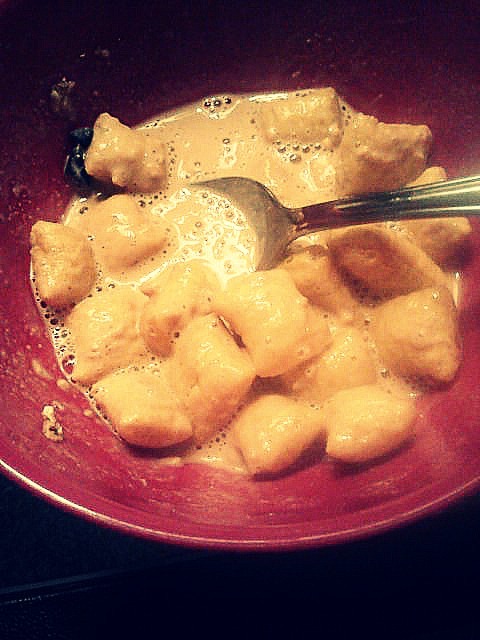 Guys, this may be my new favorite dinner (other than waffles). I made it for the first time around my birthday back in July and made it a few times shortly after, but then forgot about it as I was moving into my apartment and starting school again. I randomly decided I wanted to make it again and I am so glad I rediscovered it. 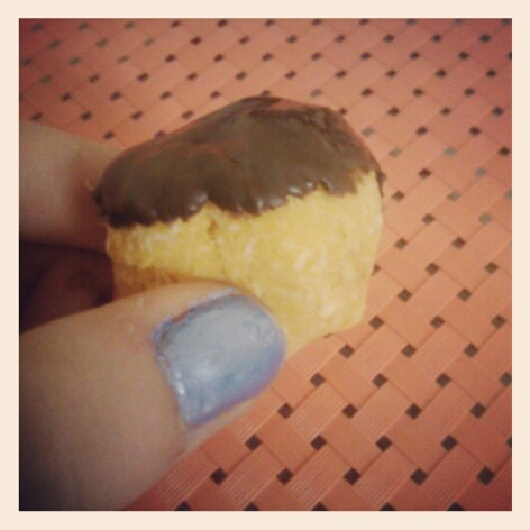 It is really so simple, but tastes crazy good. The best part is, it’s packed with protein from whole foods sources–edamame, quinoa and pumpkin seeds. Dessert: PB Puffins mixed with peanut flour, almond milk, raisins and mini chocolate chips, unpictured side of peppermint dark chocolate square and Hail Merry raw maple vanilla almonds. I don’t have cereal as much anymore, but I still have a soft spot for PB Puffins. They’re just so…addictingly good. Now when I have cereal, I like to add in some protein powder or peanut flour in with the almond milk to make it more substantial. This particular bowl was very peanutty, but good, even for a girl who hates peanut butter (but loves peanut otherwise). The total protein count for the day was 63 grams! I know that doesn’t sound like a lot, but it’s right in line (actually a little higher) than Fitsugar’s chart on protein needs based on weight and activity levels. And for me, it’s about double the protein that I was eating a year ago so I consider that a major success! And it just goes to show that vegans can get enough protein, without having to eat a ton of soy (I only had half a serving on Monday) or even a lot of supplements (I only used one full scoop of protein powder the entire day). Do you ever track your protein consumption? 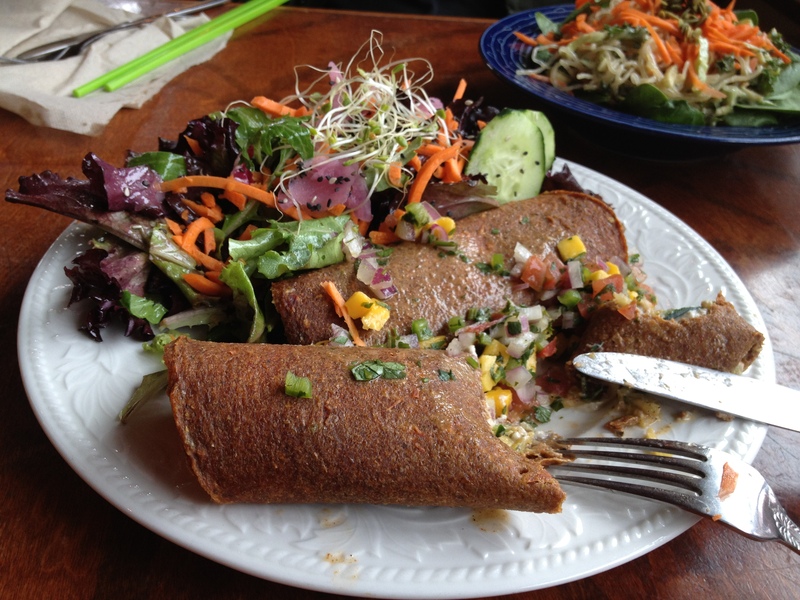 What’s your favorite plant-based protein source?